I was thinking today about all those of you that have invested us, and it really blows me away! You have sacrificed time in praying for us regularly. You have sacrificed finances and given so that we may go. You have treated us more kindly than we deserve. I feel like the most blessed person in the world. Every minute, every dime, every thought and kind word given has helped us on our way to Colombia. God has been doing a great work, and you’ve had a part! Lives have been and will be eternally impacted because of you. I tuned in yesterday afternoon in time to hear multitudes of Catholics from all over the world chanting in expectation of their new leader. Flags were waving all over the Vatican. The cry of the crowd was a cry of enthusiasm, expectation and energy as the new pope was to be revealed. Then, as the curtains were pulled back, it was announced that the pope was none other than Argentine Jorge Bergoglio, who chose the name Pope Francis. Indeed, this man is the first Latin American to ever be chosen as Catholicism’s Papal leader. He led the people in reciting the Lord’s Prayer, then a prayer to Mary. You could see expressions of hope on the faces of all who listened. 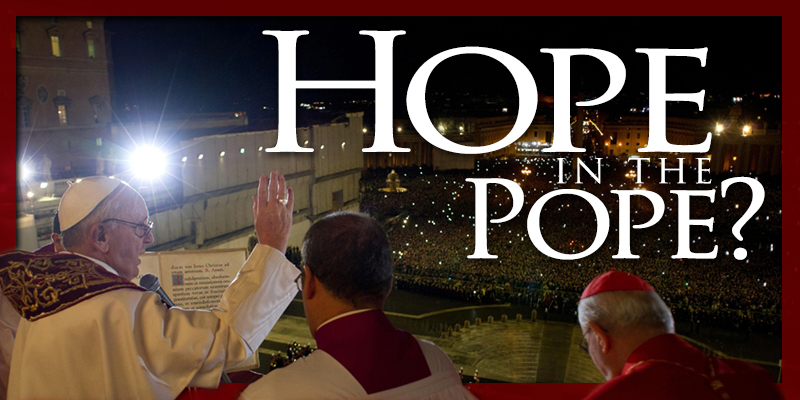 …But is there hope in the pope? I need to be careful here, because my intention is not to carelessly offend those that hold to the catholic teachings. But could I be so bold as to say, Catholicism, at its core teaching, is leading over a billion people to hell. Don’t Catholics believe in God? Don’t they believe in the Bible? Don’t they believe that Jesus died on the cross? Yes, they believe all of these truths. But what is different between biblical Christianity and catholic teaching? Simply put, it’s a matter of do vs. done. Their teachings go on to express that there are 7 sacraments of the church, and in keeping these sacraments you will have favor with God and earn salvation. Why is that? Because salvation is depending on what they do. They are initiated into the church as a baby when they are baptized, they go through confirmation as a child or young adult, and they take the communion. They confess their sins to the priest, pray to Mary, pray to the saints and other idols, and help the poor, but it comes down to one question: What is their salvation depending on? DO or DONE!? Friend, there is no hope in the pope. He is just a man. He may be a nice man, but he is a man who is leading people down a religious road straight to an eternity that is separated from God. Salvation is only by grace through faith. It is either grace or it is works. It cannot be both. Jesus already bought our salvation, and offers it as a gift to all who will believe on him. Why are you trying so hard to earn it? If you have never been biblically saved, if you are still trying to work your way to God, if you don’t know for sure if you’re eternity will be Heaven or Hell, I challenge you to do one thing. Repent. Repent of your sin and your faith in works or religion. Then believe on Jesus. Run to Jesus. Throw out any other hope that you have and cling to the cross where Jesus paid for your sins. He says he will forgive you. He will accept you. He will make you his child and an heir to all promises. He promises to give you life. Don’t wait any longer. You have God’s word on it. He never breaks his promises. Don’t wait any longer. Believe on Jesus. Christian, maybe you agree with all that I’ve written here. Would you pray with me for the billions around the world that are deceived by religion? Would you pray with me that God would raise up more laborers to take the GOOD NEWS to them, that Jesus paid it all? Would you pray that God would open their eyes, that they would know the truth, and this truth would make them free? It was 4 AM this morning. My precious 2 1/2-year-old daughter Amira was crying in desperation. So, what’s a good dad to do? Down to her room I went. At first sight of me she seemed relieved, and immediately she exclaimed, “I need some milk.” We talked some, quenched her thirst, and the conversation quickly went from her dry throat to more pressing issues. She said it in such a matter-of-fact manner that I had to try to keep from chuckling. Turns out, the monsters were not just on her wall, but also in the closet, under the bed, and on the ceiling, she told me. Honestly, I don’t know where she got that idea, but she was fully convinced of the infestation. I showed her how safe her room was, that monsters weren’t real, then I assured her that God is in our house and he keeps the monsters and other scary things away. She got tucked in and slept for a few more hours, and woke up nice and cheerful as if nothing had ever happened. Thank goodness. How many times do we act the same way? All around us there are “monsters” out to gobble us up. Maybe not the big, hairy, green ones, but our fear manifests itself in other ways. It shows up in missions all around the world. May I be bold to say, Fear-based Christianity and fear-based missions is sin. Anything that makes itself greater than my God is an idol and must be torn down. Tear down your fear. Bring your thoughts into captivity. Trust Christ. He had to remind Timothy of something that was forgotten. Fear doesn’t have to own you. God has something greater for you. The power to defeat that fear is already in you. If you don’t squash that fear, you will miss God’s plan for your life! Christian, What’s your fear? What’s the “Monster on the wall?” What’s lifting itself up above Jesus in your life? What’s holding you back from doing God’s will? It’s time to lay it aside and trust Christ. It’s time to live boldly for the ONE who gave all for us.